Herbs are beautiful additions to any container garden, either on their own or combined with seasonal flowers. They add colorful leaves, texture, scent, and culinary usefulness to plantings and attract bees and other beneficial insects as well. Use as large a pot as possible. Use good quality potting soil. 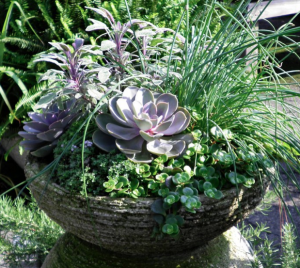 Herbs often suffer from overfertilizing, overwatering, and overcrowding. Water when dry so that water runs out the bottom of the container. Remember pots will dry out quickly in the heat of summer and during windy conditions. Empty water that may be standing in saucers. Clip your herbs regularly. This will keep them from becoming leggy and overcrowded, especially if they’ve been used in combination plantings. Harvest herbs in the morning and just prior to bloom. Near the end of the season, allow your basil to bloom; the bees love it! Finally, never prune woody herbs like rosemary to bare wood. Start with the herbs you’d like to most use, either for an ornamental or culinary addition. 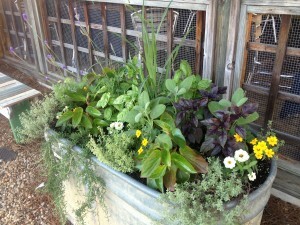 Knowing their growth habits is helpful in deciding their placement in your container. For example, use chives for a grasslike effect; thyme, trailing rosemary, and oregano to spill over the edges; lavender or upright rosemary for height; and parsley and sage as fillers in containers. 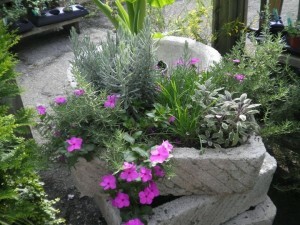 Another idea is to use one herb in a pot and group many such pots together. 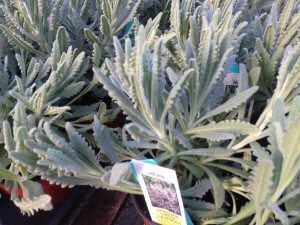 A rosemary plant, once mature, will easily fill a large 14″ or bigger planter, as will lavender. Mid-size (10″- 14″) pots can be filled with parsley, chives, sage, French tarragon, or, more easily grown in the south, Texas tarragon. The larger the pot the better! Annual Herbs Basil, Lemon Verbena, Lemon Grass (warm season); Cilantro, Dill (cool season); parsley (biennial). Perennial Herbs Rosemary, Oregano, Marjoram, Thyme, Sage, Chives, Mint, Lavender, French Tarragon, Texas Tarragon, Savory, Hyssop, Lemon Balm, Catnip, Rue, Santolina, Fennel, Germander, Summer and Winter Savory. Cool Season Herbs Cilantro, Dill, Salad Burnet, Chervil. 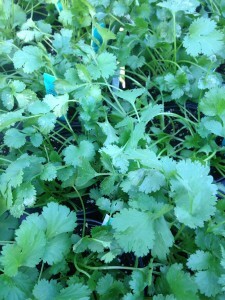 Small – under 1 foot in diameter: Parsley, Dill, Chives (garlic & onion), Cilantro, Salad Burnet, Chervil. 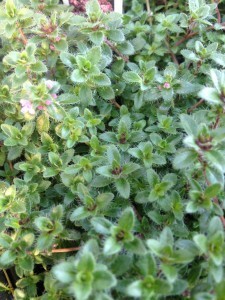 Medium – 1-2 feet in diameter: Thyme, Tarragon, Basils, Mint. 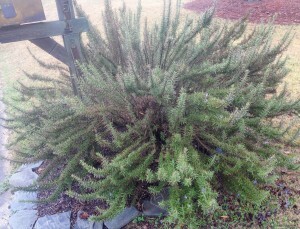 Large 3 feet or more in diameter or over 4 feet high: Rosemary, Oregano, Lemon Verbena, Sage. Dry, sunny, Mediterranean conditions: Rosemary, Oregano, Marjoram, Sage, Lavender, Thyme, Tarragon, Germander, Santolina. Cooler, afternoon-shaded locations: Mint, Cilantro, Dill, Chives, Parsley, Lemon Balm, Salad Burnet, Lemon Grass. Common methods of propagation of perennial herbs: Divisions: Chives, Mint, Thyme, Oregano. Cuttings: Rosemary, Lavender, Sage, Winter Savory, Lemon Verbena, Rue. Pests & Diseases Of Herbs Careful cultivation of your herbs will help keep them healthy and less susceptible to pests and diseases. Provide adequate water when needed, plant with the proper spacing for the best air circulation, and place them in the right amount of sun. Chemicals, obviously should not be used on any herbs you plan to harvest. Insecticidal soap or a strong spray of water is generally enough to deter most pests. Aphids – Soft-bodied insects found on new growth and easily controlled by a strong spray of water or insecticidal soap. Whiteflies Can be problematic, spraying the undersides of the leaves consistently with insecticidal soap is necessary to eliminate them. In large infestations they’ll fly out of the center of the plant in a white cloud when disturbed. An important point to keep in mind is that spraying with the wrong insecticide can make whitefly problems worse, since spraying with the wrong insecticide will kill important predatory insects and tiny parasitic wasps that help control whiteflies. These naturally occurring beneficial insects are the best way to control whiteflies, and whitefly outbreaks generally occur when this natural control is disrupted. The best course of action is to preserve beneficials by avoiding unnecessary insecticidal treatments. Look HERE for more information from Mississippi State University. Leaf Hoppers – These insects hop from plant to plant so are known to spread diseases. Control with insecticidal soap spray. Remove any garden debris each fall to reduce over-wintering sites. Thorough coverage of both upper and lower infested leaves is necessary for effective control. Leaf Miner – Burrowing insects that live inside leaves and are identified by the white “trails” on the leaves. The best control is to cut the plant back and throw away (Do not compost.) those leaves. Common on parsley in particular. Caterpillars – Always try to identify caterpillars before you get rid of them! Swallowtail butterfly caterpillars are commonly found on parsley, fennel, and dill. Bt and Sevin dust will control those you do want to eliminate, as will hand picking. Powdery Mildew – Mildew is caused by too little air circulation. Thinning the plant and clipping back surrounding plants to improve air movement will help. 1 Tbsp baking soda. ½ Tsp liquid soap 1 Tbsp light horticultural oil in 1 gallon of water. Always spray in the coolest portion of the day, avoid spraying when bees are active, and test this on a small portion of the plant first. The oil coats and smothers the fungi, and the soap helps the mix cling to the upper and lower portions of the leaf. This entry was posted in Container, Container Gardening, Herbs, Planting Tips and tagged basil, chervil, chives, cilantro, container gardening, controlling aphids, dill, herbs, herbs in containers, marjoram, mint, oregano, organic fungicide, parsley, pests on herbs, powdery mildew, rosemary, sage, salad burnet, savory, tarragon, thyme, trailing rosemary, whitefly control on herbs on September 10, 2014 by Kris Blevons. 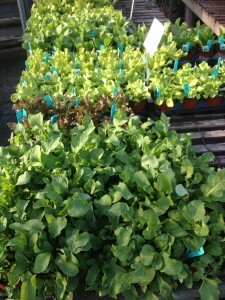 Herbs and Some Annuals In Stock Now! This post is mostly about herbs, but we’ll mention a few annuals you can plant now too. Everyone is getting spring fever, but this is that tough time of year when it’s best to sit tight and wait out these last few weeks of winter…we know it’s hard! So, not to worry, if you just need to get out in the garden or maybe plant a few pots on one of those beautiful early spring days, here are some plants that will satisfy your cravings now. 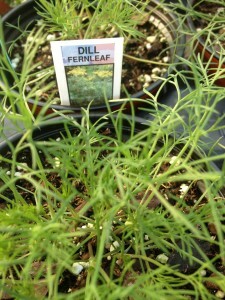 First up, dill and cilantro. These are two herbs that you really must plant early, because once the real heat of early summer moves in, these will bolt, or flower. Now, with your dill, this isn’t all bad because when the flowers are spent you end up with dill seed which is great for pickles…(Let the flowers stay on the plant til you see the seeds forming.) but the cilantro will flower, or bolt, and give it up once summer arrives. So, plant now and enjoy if you like these two! Next up, not an herb but we’re going to put it in this post anyway, is lettuce. If you didn’t plant it this fall it’s not too late to get a late winter crop going that you can enjoy until the heat sets in. 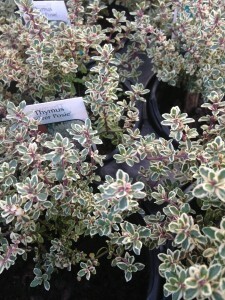 We’re just beginning to get in some thyme – there are so many varieties! Right now we have ‘Silver Posie’ and ‘Red Creeping’. We’ll have plenty of culinary thyme, lemon and silver thyme in the coming weeks too. If you don’t have at least one rosemary in your landscape, try to find a sunny spot for one this year, either in the ground or in a pot…rosemary is really a big shrub and of course it has great culinary uses as well as being ornamental – there are many varieties of rosemary – what we normally have in stock is a mix of upright and trailing. At this time we have the more upright growing varieties. 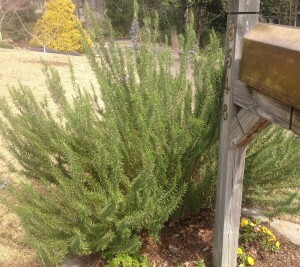 Rosemary blooms in the early spring with purply/blue blossoms that compliment the gray-green foliage beautifully. Yes, that is one rosemary! 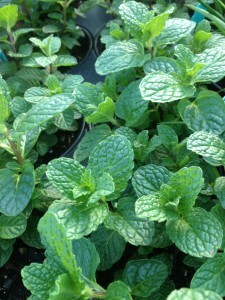 We have mint too – ‘Kentucky Colonel’ is the prettiest and best tasting there is. Remember to keep your mint contained in a pot unless you want it to take over your garden! Mint is also happiest with a bit more moisture than other herbs and it can also take a bit of shade…you’ll be set for the Kentucky Derby and your mint julep – or maybe a mojito? Parsley, both curly and flat leaf is also available – all the best cooks say flat leaf is the tastiest…but curly is very pretty in the garden and in pots, so we’ll have both and leave it up to you which one – or both! you want in your garden. Lavender and ornamental variegated oregano round out this first list of herbs…these are really for blooms and foliage more than culinary use. Lavender can be tricky in our heat and humidity, ‘Goodwin Creek’ lavender pictured here does well if given adequate drainage. 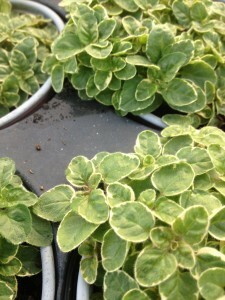 The variegated oregano one the right is one we really like in pots…it adds a bit of foliage interest in herb containers and in mixed annual plantings as well. We’ll have the culinary oregano in soon also. 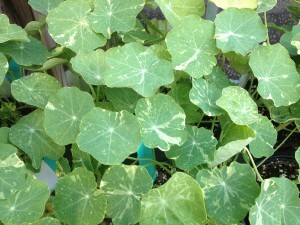 Nasturtiums are so much fun we had to include them in this post. Ok, technically they’re an annual but you can eat them too! They’ll add a peppery bite and some color to your salad! If you plant nasturtiums, don’t baby them too much. Don’t fertilize them – they’ll bloom better if you don’t. Enjoy them til the heat of summer takes them out, then replant them again in late summer to bloom for you through the fall. Whew! This is just the beginning! So, there are some things you can do now while we wait for the last of winter to get out of here…happy planting! This entry was posted in Annuals, Herbs, Spring, Vegetables and tagged cilantro, dill, lavender, lettuce, mint, nasturtiums, parsley, rosemary, spring, thyme on March 13, 2013 by Kris Blevons.